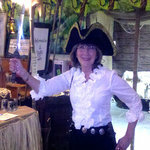 Sherry, you did such an outstanding job last night at our Treasure Island-themed auction. With your expert help, we blew past our $100,000 net revenue goal by more than $20,000 — and raised the most money in auction history for The Heights. Thank you from the bottom of our black hearts!